The proposed claim for Judicial Review relates to the Mayor’s Decision, announced on 20 October 2010, to remove the WEZ, without putting in place measures to maintain the air quality throughout the WEZ area, in accordance with the obligations of United Kingdom (UK) and European Union (EU) law. The LBA was also issued to Caroline Spelman, Secretary of State for Environment Food and Rural Affairs, since Defra is responsible for the UK’s compliance with UK and EU air quality laws. The LBA highlights concerns over the Government’s failure to intervene in relation to the WEZ and its reapplication to the European Commission for a time extension until 2011 to comply with the daily limit value for dangerous airborne particles (PM10) which mistakenly included the WEZ as a planned measure. “Air pollution in London is much worse than most of us have realised. For example, the Mayor has estimated some 4,300 premature deaths in London in 2008 were attributable to long-term exposure to the smaller PM2.5. 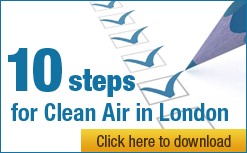 “Clean Air in London has instructed Harrison Grant to issue a ‘Letter before Action’ (LBA) to show how seriously it takes: the increase in air pollution that would arise if Mayor Johnson removes the WEZ without adequate mitigation; and the Government’s mistaken inclusion of the WEZ in its reapplication to the European Commission for a time extension until 2011 to comply with legal standards for dangerous airborne particles (PM10) and avoid £300m fines. Clean Air in London is separately urging the European Commission to reject within weeks the UK’s flawed reapplication for a time extension on PM10. “To put the issue in context, the Mayor’s own consultation documents estimate that emissions of PM10 would increase by 3-4% on average across the WEZ area if the scheme is removed compared with an estimate in his draft Air Quality Strategy, of a 13% average reduction between 2008 and 2011 for London as a whole. “Ambient air quality concentrations are much harder to reduce than emissions. “The Mayor has chosen a seemingly populist route despite Transport for London’s (TfL’s) analysis of the traffic, environmental, revenue, economic and social impacts showing overwhelmingly negative results. At least one impact – the need to comply with health-based air quality laws, if necessary through mitigation measures – must not be dismissed. We should expect the Mayor of a large and complex city to ‘walk and chew gum’ at the same time. “Clean Air in London hopes that when these matters have been considered further by the Mayor – who says he is keen to seek improvements in the environment and public health – he will act decisively to being down air pollution in the WEZ area. 5. air pollution will worsen within the WEZ area. 8. alternatively, to reverse his Decision removing the WEZ. 10. in any event, to write to the European Commission’s Environment Directorate notifying it: (1) of the planned removal of the WEZ in London; (2) the full consequences of that Decision for the UK’s ability to comply with UK and EU air quality laws; and (3) of the impact on the UK’s pending reapplication for a time extension until 2011 to comply with the PM10 daily limit value throughout London (which included the WEZ as a measure being taken). Mayor Johnson and the Secretary of State are both also asked to consent, under the Aarhus Convention requirements for access to justice in environmental cases, to a protective costs order limiting liability for adverse costs against CAL if the matter were to progress. “The Mayor will need to weigh the public support for removal against the potential adverse impacts highlighted in Chapter 5”. Social include Equalities, Health and Safety. Stakeholders: 39% stakeholders said WEZ should not be removed. 34% wanted it removed. – Of three options: 41% of public preferred removal; 30% of public preferred keeping it; and 15% of public preferred changing it. A Judicial Review of the Mayor’s Decision to remove the WEZ would need to be lodged in the High Court. The proposed claim would relate to the Mayor of London’s Decision, announced on 20 October 2010, to remove the WEZ without first putting in place measures to maintain the air quality throughout the WEZ area in accordance with the obligations of the United Kingdom under Directive 2008/50/EC. Any Judicial Review is likely to be heard pretty quickly but the precise timing would be unknown. If CAL launches a Judicial Review and is successful, the Mayor would be required to think again. In CAL’s view, this is likely to mean – as everyone has been wanting – that serious action would be taken to reduce air pollution in London and protect public health.